As most watch collectors, I have a meticulous and studious process that governs my watch buying activities. Usually, months go by before the moment I identify a watch that has caught my interest and the moment it is on my wrist. In these months, I research everything about the watch itself and its corresponding brand. This research phase serves as a buffer; it’s a gatekeeper that limits my interest in watches from running amok and ruining my bank account. Ultimately, this process ensures I spend my money on a watch that’s well vetted and meets all of my criteria. 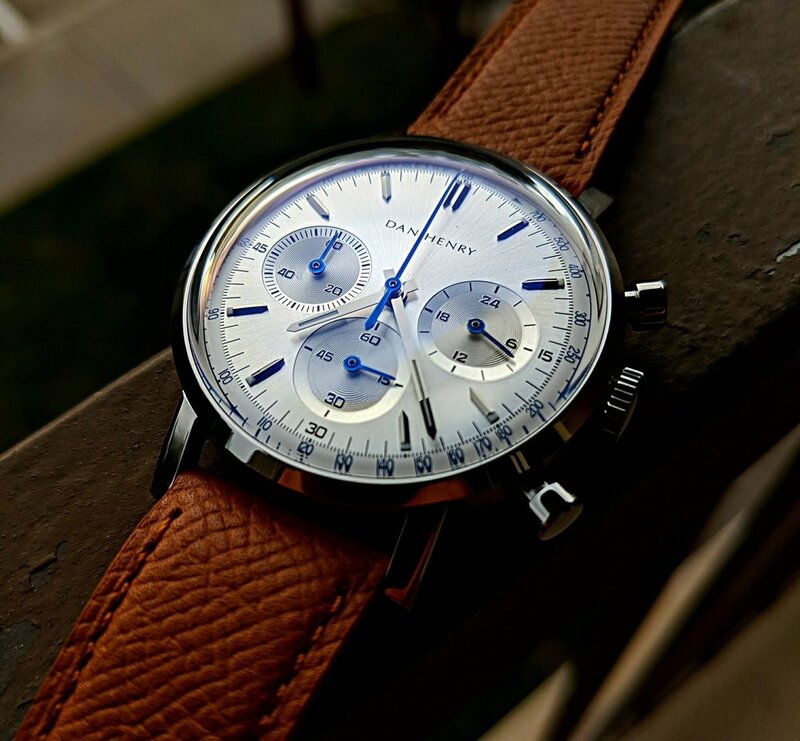 The Dan Henry 1964 is the first and only watch (to the date of this review) that has entirely bypassed this process. I had heard of Dan Henry’s watches quite a bit. A few of his pieces had caught my attention, though I never got around to pulling the trigger on one. I first saw the 1964 on Instagram. I looked up the specifications, and within minutes, I purchased it. I was hesitant and ready for disappointment, since I forgot entirely about my “process”. It’s been a few weeks since my impulse buy, and I am still ecstatic over my purchase. In this piece, Dan Henry alludes to some of the great vintage chronographs, like the vintage (and legendary) Heuer Carrera. The small case size (38mm) sits perfectly on the wrist, almost indistinguishable from the great watches of decades ago. 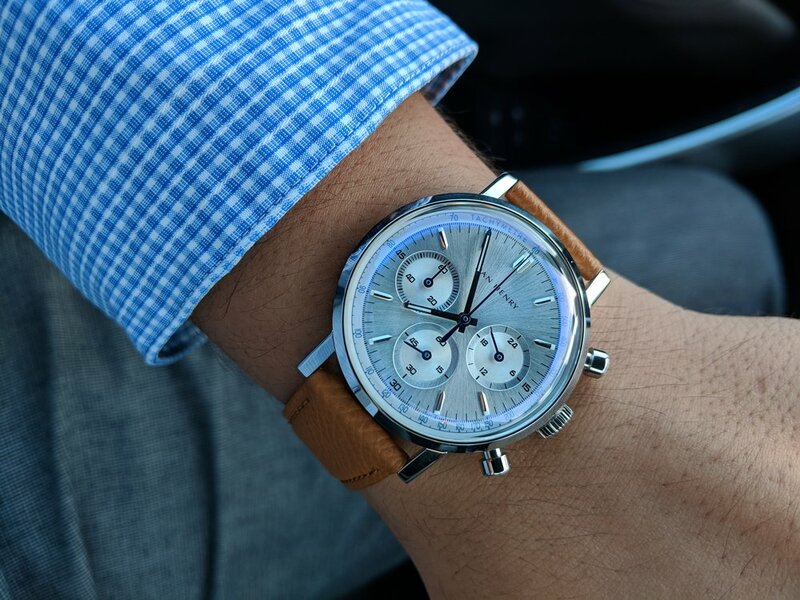 The large pushers follow suit and give out a great vintage vibe, while allowing easy access to the chronograph feature. The large AR-coated crystal screams vintage watch and gives a beautiful hint of blue, when under the correct lighting. This tone of blue pairs beautifully with the blue hands (on this silver version) that offer a great contrast from the all sunburst silver dial. Inside, a mecha quartz movement beats. The screw-back caseback features a great 3D embossed image of an Aston Martin DB5 automobile. Included with this piece is a beads of rice bracelet that is extremely flexible and comfortable. Normally, I don’t talk about packaging, as I feel, most of the time, it takes attention away from the actual watch. However, I will make an exception for this piece because of how tasteful the packaging was on the 1964. Upon opening the shipping packaging, you are met with a black capsule, with the small printing reading “Dan Henry”. Inside the capsule is a small watch pouch with the watch (on a great brown leather strap) a warranty card, and beads of rice bracelet. To me, this is the “perfect amount” of packaging I like to see in a watch. It’s more than a boring cardboard box and pillow, but it’s not so over-the-top that it makes me wonder how much of my money is going towards packaging, rather than the watch. 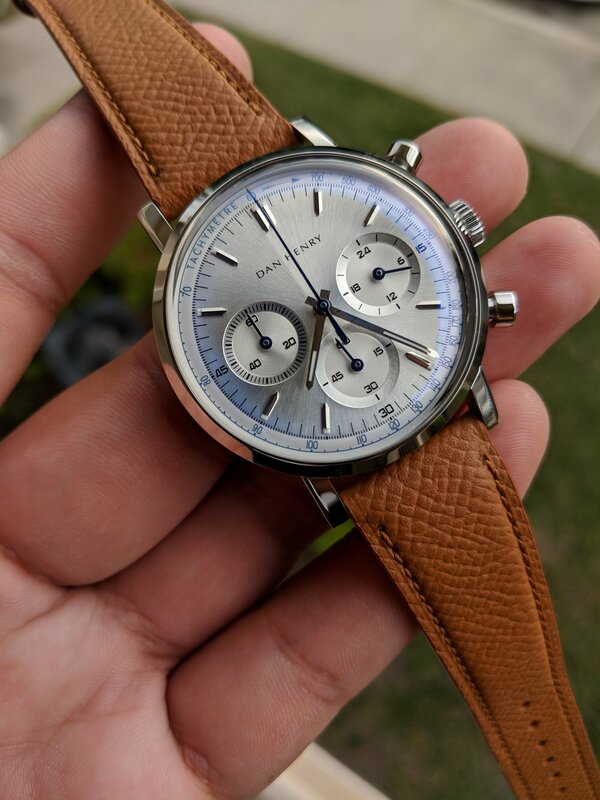 I really enjoyed Dan Henry’s choice, and it certainly plays well with the overall them of the watch. I’ve owned this piece for a few weeks, and it has received a significant amount of wrist time. Simply stated, it wears wonderfully. The small case size makes it extremely light and comfortable to wear, however, the tall dome crystal adds some presence on the wrist. I’ve owned quite a bit of vintage watches, and this one wears indistinguishably from those older pieces. · As mentioned above, the size on this piece is absolutely perfect. Had it been a millimeter smaller, I feel it would have been too small. Had it been a millimeter bigger, it would have bordered on too big. Not too cold, not too hot. · The bracelet and strap that are included are fantastic. Both are extremely comfortable and have a high quality feel to them. · Dan Henry managed to include some tastefully executed lume markers on this piece, without distracting from the clean aesthetic. · This option comes in 4 variants: Black, Slate, Panda, and Evil Panda. Each option is available with and without a date. All of these options, from a micro brand, are certainly appreciated. · As much as I love this piece, I wish the lug width had fallen into an even number. At 19mm, this essentially eliminates 100 percent of my watchstrap options. It also eliminates about 95 percent of strap options available to buy. As a lover of watchstraps, this was disappointing to see. I always preach about “value” or the best “bang for your buck”. I tend to favor Japanese watches because they often offer unbeatable value. However, Dan Henry has been able to price himself against some of the heavy hitters and has been able to compete aesthetically against just about anyone in any price range. For a micro brand, that is close to unheard of. This described packaging, a watch roll, a beads of rice bracelet, a leather strap, and this beautifully designed watch is available for $250, shipped. I’ll be following Dan Henry’s future endeavors very closely. This one will certainly be hard to top. They’re certainly worth your time and money. The 1964 can be found here.